Chris Rice's latest CD taps into a broad spectrum of styles and topics. His first radio single 'When Did You Fall' is a refreshingly innocent romantic-comedy, while the optimistic perspective in 'Lemonade' balances the melancholy title song 'Amusing'. 'The Final Move' is Chris' clear and beautiful declaration of hope for humanity. Also appearing on the CD is legendary guitarist Duane Eddy, considered one of the most influential rock 'n' roll guitarists in history. This is fun stuff, mixed with some deep stuff too. That's what you always get from the introverted, honest writer and singer, Chris Rice. :Chris Rice's latest CD taps into a broad spectrum of styles and topics. His first radio single 'When Did You Fall' is a refreshingly innocent romantic-comedy, while the optimistic perspective in 'Lemonade' balances the melancholy title song 'Amusing'. 'The Final Move' is Chris' clear and beautiful declaration of hope for humanity. 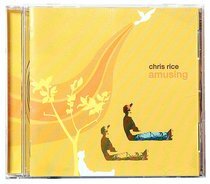 Having never listened to any Chris Rice' CD's, I transferred in "Amusing" and thought I would give it a go. Needless to say that CD did not make it to the shelf, I had to buy it and take it home the same day. This has to be one of the most infectious CD's I have heard to date. I fell in love with so many of the songs proving that this is not a one hit song CD - EVERY song is excellent. Rice gives you everything, he is extremely witty which is a really fun thing to find in songs, he can pull at your heart strings and he can also get you boppin'. The song "when did you fall" will have you reminiscing about when you first fell in love. "Lemonade" is so catchy you will find yourself singing along before the song ends and may just have it stuck in your head for the rest of the day. And when I die I want "Breakfast Table" played at my funeral (not that I am planning that any time soon)! Chris rice is not plain boring boiled rice, "Amusing" shows that he is the Fried Rice Special with extra prawns. This is a MUST HAVE for your CD collection and I will be singing its praises for a long time to come.